There is one post tagged milan. “What is trapped?” he asked me, giving me a slightly amused look, gesturing with his hands, which were wide apart, as if emphasizing a point in a high school declamation contest. I looked at the pigeons in the square, thinking how easy their lives were. Every single day without fail, these birds got by on leftover pieces of bread people fed them. Meanwhile, here I was, at Italy’s famous Piazza del Duomo, grappling with a quandary rarely experienced by anyone, both in Manila and Milan. No, I wasn’t hungry. Nor did I have to go to great lengths to get my next meal—it would come from my wife who held our cash and planned our no-frills vacation. Despite the privilege of being in Europe, I still felt that the pigeons were luckier than me. After all, as I was contemplating the various synonyms of the word “trapped,” my wife was locked inside a nearby restroom trying in vain to get out. So how do I tell a carabinieri in very simple English that my wife was trapped inside a cubicle with a jammed lock? After all, I was an English major. And this was my one chance in a million to prove to everyone that a Bachelor of Arts degree—or at least the one that I had—was useful in real life. It was very easy. All I had to do was to process the knowledge I gained in college and put them to good use. Except that I had extended my stay in college because I was always drunk and/or sleepy, which, by the way, explains why I also dropped my basic Italian language class. Had I known that ditching Italian would prove crucial some fifteen years or so after college, I would have completely aced it, just like the time I got a 1.0 after taking a Philosophy course the second time around. But then again, as the Romans say, praemunitos, praemunitas, a phrase which I occasionally use to show that I understood Latin. I don’t. Which explains why I didn’t rely on my tertiary education when my wife called out my name the minute she discovered that she was locked in. Like all neanderthals who mistakenly consider themselves heroes, I rushed into the ladies’ room, knowing that I was venturing into unknown and dangerous territory. Fortunately, it was still early in the morning and the area wasn’t congested. Of the three women using the facilities, only two were able to exit their cubicles with ease. None of them happened to be my wife. To justify my existence inside the ladies’ restroom—and to avert any attack from formidable Italian women armed with thick leather handbags and stilletoes—I went to the cubicle in question and assisted my wife with the lock. After a few minutes of fiddling with it, I gave up and told her that I would be back with someone to help us. This now brings us back to my original quandary. Restraining his smile, the officer agreed to accompany me. However, when we arrived at the scene, my wife had already escaped the clutches of the stubborn door lock. How she did it, I will never know. After all, she was the acclaimed poet in our family and I was just the useless English major. “Grazie,” I told the police officer as he left, grateful that I didn’t have a hangover the day the professor told us how to express thanks in Italian. 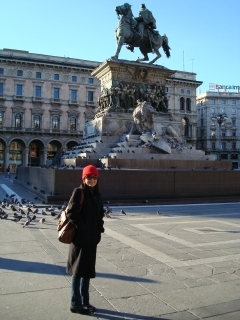 Photo above shows a cheerful Conchitina R. Cruz posing at a statue located at the Piazza del Duomo, unaware of the dangerous consequences that would befall her while inside a Vittorio Emanuele restroom a week later.